Not every motorcycle accident can be avoided. You may find yourself in a situation where you need a motorcycle attorney to help you deal with the aftermath of a collision. However, there are steps that you can take to practice good motorcycle safety and prevent some of the more common accidents and issues that occur on the road. 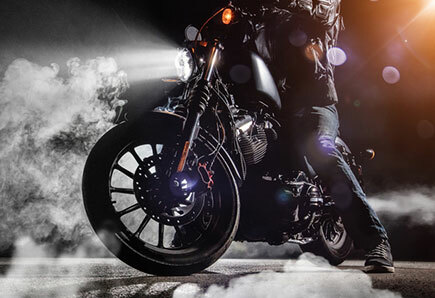 According to the United States Department of Transportation’s National Highway Traffic Safety Administration, 11% of all accidents involve motorcycles, and motorcyclists are 35 times more likely to be involved in fatal accidents than drivers in other types of vehicles. As a motorcyclist, you must always be alert, and keep the following safety tips in mind. Statistics have shown that motorcyclists who ride without helmets are 40 times more likely to die in accidents than riders wearing a properly fitting helmet. Helmets can significantly reduce the risk of fatal head injuries during accidents, which are the leading cause of deaths in motorcycle accidents at 37%. Proper helmets also reduce the risk of sustaining a non-fatal head injury by 69%. Other safety gear in addition to helmets is important. This includes proper motorcycle shoes, gloves, and eye protection. These are the only barrier between your body and the road, so make sure you are purchasing and properly wearing high-quality gear designed to keep you safe. Enroll in motorcycle safety courses to improve your handling of these and other safety issues. These courses typically provide both formal in-class activities, motorcycle riding exercises, looking at a variety of different motorcycles, lessons on proper motorcycle maintenance and operation, as well as lessons on all the risks that come with owning and operating a motorcycle. If you want to know everything you need to know about the hazards of being a motorcyclist and how to remain safe on the streets, a motorcycle safety course is an important foundation. If something does go wrong, you are not without options. Whether you’ve been involved in a collision in Riverside or Corona, Temecula or Rancho Cucamonga, it is important to find a motorcycle accident attorney who you can trust to get you back on the road again. Give us a call today at Inland Empire Motorcycle Law. Dial (951) 290-3664 to find out what our California law firm can do for you.